One of the things I do in my day-job is mentoring new planners. After each session, I write a note and post it in this blog as a new installment of “planning communication strategy for beginners” series. I hope one day this series can be published as a textbook, both in Indonesian and English. Creative briefing (i.e. writing the creative brief and delivering it to creative craftspeople) is the main responsibility of planners. Of course no planners can produce decent creative briefs without collaborating with suits or creative craftspeople. But this still means that planners should be held accountable when the quality of the briefing is bad. The most fatal —yet sadly pervasive— misconception about creative briefs is equating them with instructions for creative craftspeople on what they should put into an empty canvass. This is often evidenced when a planner says, “Here’s the proposition, now make a layout or a script or a booth-design from it”. This is wrong. Creative briefing is not about giving instructions. It is about inviting creative craftspeople to solve problems. What a creative brief is all about. Once we see creative brief as an invitation to solve a problem, we will have a different understanding about what a good brief is and what it should contain. Every agency has its own creative brief template, and frankly I don’t give a hoot about which one is the best. It’s not about the template. It’s about the clarity, logic, and the brevity of the content. Question #1: What is the problem we are trying to solve now? What stands in between. This is where we elucidate what we believe as the core of the problem. Tragically this is the part that’s missing in mediocre creative briefs. Don’t use marketing jargons. Jargons normally refer to the symptoms of a problem, but not the problem itself. Rewrite the problem from the communication target’s point of view. What is the problem we are trying to solve now? The category of mainstream milk has been decreasing steadily, while we observe a growing trend in growing-up milk, flavored milk, and even yogurt-based drink. As a mid-size player in mainstream powder milk, Brand X has also been experiencing declines in both sales volume and market share. It seems that Brand X needs to reinvigorate its awareness, appeal, and relevance amongst consumers. Brand X needs to stop the decline in sales volume and market share in mainstream milk category. Yet more and more, Indonesians consume less and less mainstream milk. Data suggests that they switch to growing-up milk (perceived as offering more health benefits for children), or to flavored milk and yogurt. We hypothesize that consumers now see that mainstream milk as unnecessary and unexciting. The first example is filled with jargons (awareness, appeal, relevance), yet it doesn’t clearly explain what stands in between the current and ideal situations. This is different from the second example, where we can easily find the hypothesis about the root of the problem from the communication target’s point of view. As we can see, the second example is a better invitation to solve this problem. Question #2: What’s the role of the communication? In a good creative brief, the writer puts forward his/her hypothesis of what the core of the problem is. Now in this part, the writer needs to propose another “theory” on the specific role of communication to solve the problem. The creative brief must have an opinion on what exactly the communication does that gets the problem solved. This part will be directly related to the strategic intent that I have previously discussed[ii]. Increase awareness of Brand X. Educate consumers about the benefits of brushing teeth before bedtime. Drive engagement with Brand Y (or, another version: deliver branded experience). Start a “standing-up while working” movement. These are the most important parts in creative briefing, and they represent the true tests of a planner’s capability. These two parts stand for a planner’s most important contribution in strategy development: diagnosing and reframing the problem, and determining the specific role of the communication. What is the hallmark of a well-written, thought-through role of communication? It spells out the change that needs to happen within the communication target. For example, in “To render non-smoking as an act of rebellion” suggests that in the current situation, the communication target considers smoking as an act of rebellion. It explains how we want the communication target to respond. For example, in the Chrysler example above, we exactly know how it wanted the future car buyers in the US to feel about this brand during the financial crunch. I learned the importance of asking creative questions overwriting propositions from Scott Lukas, the same guy who taught me that communication is about stimulus-response. You can learn more about creative questions from his blog[viii]. Question #3: What is the most relevant information about the communication target we should know, so we are in a better position to solve this problem? Writers of creative briefs need to carefully select which information or data must be shared. Don’t just fill in this part out of habit or just to fill in the form: first the demographic, then the psychographic, then the “insight”. In essence, this part must elaborate the “what stands in between” element from your answer to Question#1. This part should succinctly explain what it is in what the communication target believes, or feels, or does, that gives birth to the problem we’re trying to solve. Question #4A: What do we want the communication target to remember/believe? Question #4B: What do we want the communication target to feel? If we get the role of communication right, then this part may seem like a reiteration. Personally I don’t mind this repetition. Firstly, this could act like a “checkpoint” if we get the problem definition and role of communication right. Secondly, some creative craftspeople prefer to remember this part over any others from the brief. There’s another reason why we should not skip this part. Asking Question #4B forces us to be more conscious about the emotional response we want to trigger from the communication target. I have discussed how utterly important emotional responses are[ix]. In fact, more and more psychological studies show emotional response is more likely that drives our communication target to change, not cognitive one. Question #5: What’s the budget and timing? Well, clients, you’re wrong on this. Creativity doesn’t emerge out of a vacuum. It happens when we try to work with restrictions. Creativity needs restrictions, especially that we’re here to solve your problems. The nature of problems is they always have a set of possible parameters, and this includes budget and timing. (This kind of retort has compelled my employers to ensure a good suit always accompanies me whenever I meet clients). Question #6: Is there any other non-negotiable mandatory? This is where reality sinks in. Sometimes we’re stuck with “historical obligations”, like a brand representative or a hideous logo. Do try to challenge them. Should you fail, I advise you to embrace it. See it as the restrictions we need to work around, just like budget and timing. So those are the essential questions an acceptable creative brief must answer clearly and concisely. Anticipating your questions, I’ll explain some more about the less essential (or even unimportant) parts of a creative brief. What about proposition? Is it not important? Understanding the problem and prescribing the role of communication is more important than writing propositions. This is because a creative brief should be considered as an invitation to solve a problem, not as an instruction to creative craftspeople. Emphasizing too much on propositions means we still operate with the “instruction” mindset. A statement about the role of communication calls for more imaginative and broader solutions, compared to a proposition. A proposition that a planner writes is just one possible solution amongst many others on how to solve the problem. We must recognize that others are very likely to come up with much better solutions. Creative craftspeople —at least the good ones— like to see themselves as problem solvers. The instructions of “please make a script or a poster with this proposition as the theme” don’t ignite them. But they get excited with the challenges of using creativity to solve problems. And when they get excited, they work better, and they will eventually respect planners more. Unfortunately, there are too many of us who keep jumping prematurely to “what we need to say” before taking enough time and effort to fully understand the problem and the role of communication. What if I need to make sure creative craftspeople understand what the brand stands for? Should I write it down in a column titled “Brand personality” or “Tone and manner”? In case you are working with people who previously have never worked for the brand, it’s fair to give them this information. Use verbs. Dan Wieden says, “Brands are not nouns. Brands are verbs”. So express what a brand stands for as what it does to people’s lives. Nike unleashes the inner athletes in everybody. Apple gives you delightful experiences to consume and create content. Google organizes all information that’s available in this planet online. Use brand’s belief. Ask this question, “According to Brand X, the world is a better place if…”. “Brand X fights against…” “For Brand X, life is wasted if we…”. For example: Dove believes that there should be many and diverse definitions of beauty. Oprah (the TV channel and program, the magazine, the personal brand) believes every woman should be able to live up to her own best version of herself. Please don’t describe a brand using a set of adjectives. Adjectives make vague description. For example: “She is smart” is not as instantly understandable as “She gets the instructions right the first time, and executes without errors”. How long should a creative brief be? My boss insists on one page. Do you work in my agency? I’m the kind of person who insists that a creative brief should be no more than one page with normal spacing, and that already includes agency’s logo, descriptions, sign-off boxes, etc. It’s important to keep the creative brief, well, brief. It forces us to carefully select the information we need to include. It forces us to be disciplined in our logic when formulating the problem and the role of communication. I have been imposing another rule besides the one-page brief in my agency. The creative question must be able to be written in one single Tweet. It can’t be longer than 140 characters. Any other advice on how to write creative briefs? Remember that the audience of your creative brief is the creative craftspeople —not your clients, and not your boss. Write clearly and use words they will understand. 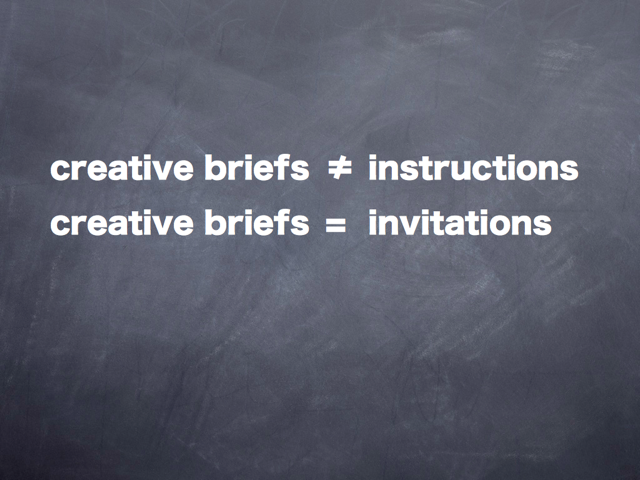 Also, a creative brief is an invitation. Be respectful in writing it. Do you have any other questions about writing or delivering creative briefs, dear readers? → So you want to be a good planner? You can start here, now. ← Apa yang salah dengan kultwit?